Who doesn’t love Fauja Singh? 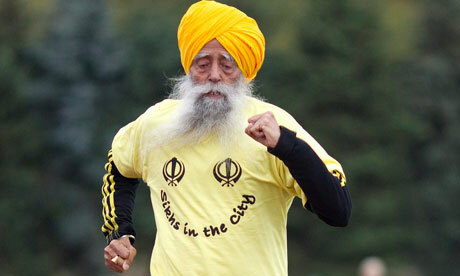 Any guy who can run a marathon at 100 years old is pretty impressive. But this post is about folks a little younger (in their 60’s and 70’s) who run a whole lot faster. Think sub-3:00 marathons at 70 years old. For the past several months, Canute’s Efficient Running Site has been running a series of posts on how exceptional older runners stay in shape and train. It is definitely a fantastic read. Here’s a quick recap of what I learned– plus my take on how to be a great older runner. While I can’t give you any advice for living long enough to even be in Fauja’s age group, I can tell you how to train to beat him. So who were these runners that Canute examined? Be prepared for some pretty remarkable older athletes– even in their 70’s most of the could smoke me. Ed Whitlock is the only guy to consistently run sub-3:00 marathoners at over 70 years of age. A prodigious high-school runner (4:31 miler), he gave up running in college because of achilles tendon issues, but returned to running in his 40’s and ran 4:09 at age 45. His secret is daily long runs (2+ hours extending slowly to include lots of three hour runs) at an almost shuffling pace on a loop near his home (so he can easily abort the run if injuries pop up). After an injury, he starts back at less than an hour and gradually adds 10 minutes a week. Speedwork comes in races and fartlek workouts done every other week. Hoshihisa Hosaka (try saying that fast five times) didn’t start running until his thirties but quickly showed his natural talent by running his debut marathon in 2:31:19 and a personal best of 2:25:28 only a few years later at age 45. Over the next two decades, he dominated his age group and recently captured the M59, 60, 61, 63 marathon world records. His training is entirely different from Whitlock’s– instead of a long 2-3 moderate run, Hosaka’s training comprises daily doubles (a morning and evening run) of intervals— yes intervals. His morning routine is a 1.5 mile warmup, then 5 x 1km intervals (starting at 25 seconds slower than marathon race pace and progressing up to 10k race pace), then a 1.5 mile jog home. His evening workout comprises a 12K warmup, then 5 x 1km intervals (starting at marathon pace and progressing up to 10k race pace), and 5 x 100m sprints. All this comes out to a hefty 20 miles of running a day. Unbelievably, this is the program that he has followed every day for over 20 years! When he failed to break the M64 record in 2013, some cracks started to show and there were some suggestions that a slightly lower intensity program might be in his future. John Gilmour had a much rougher start, spending many nasty years as a prisoner of war. Maybe this experience helped toughen him for his later accomplishments, such as setting the M60-65 record at 2:41:07 and M70-75 record at 3:03:04. Unlike Hosaka and Whitlock, his running included demanding tempo sessions. Eric Ӧstbye was a strong runner from his 40s to his 70s and always at the top of the age rankings. He wasn’t allowed to race the Mexico Olympic marathon because he was considered too old (47 years old), even though his best time that year (2:20:55) was awfully close to the winning time in Mexico (2:20:26). His training was characterized by daily long slow runs of 20 miles or more augmented by only a small amount of fast running. In this regard, his training mirrors Mr. Whitlock’s quite closely. John Keston didn’t take up running until his 50s but then ran 2:52:32 when he was 64 years old. Initially he trained hard with lots of track intervals but then broke his hip, then broke his left leg and then seriously ripped up his toe tendons– all within 2 years after turning 73. Instead of giving up, he changed his running to include long 2-hour runs every 3rd day with similarly long walks on other days. This slower running apparently didn’t slow his racing as he 3:19:01 at age 77. It’s hard to put John Keston into a category, as his training changed so much after his accident. Nevertheless, it is tempting to look at just his performance after age 73– because 3:19 at age 77 is such an incredible feat– and put him in the same category as Ed Whitlock. Derek Turnbull was a lifelong runner who achieved great success in college. But it is his later years that are most extraordinary. He run 2:38:47 to set the M60-65 record and then set the M65-70 record at 2:41:47. His training. didn’t follow a specific plan but appeared to include lots of mixed running on soft surfaces on his property. Luciano Acquarone was a natural runner who hit 2:20:21 at age 42. Even after tendinitis surgery, he continued to hit incredible marks, such as 30:05 for the 10K (M50-55 WR) and 2:28:28 for the marathon and, more recently, ran 3:10:57 at age 75 and set a world record at 3000m in M80-85. Consistency. The key trademark of these older runners is the consistency with which they train. By avoiding a hard-easy program, these athletes are able to monitor how they feel each day with a greater degree of precision. But this day-in, day-out consistency comes at a cost– not having a well-periodized training program. Good Genetics and Early Potential. With the exception of John Keston, every other great older runner started running early and had great success– and I suspect that Mr. Keston would have been tearing up the local races had he started running earlier. Clearly, every one of the these runners had great genetics. Canute also points out that each of these runners had really high maxVO2’s and VDOT’s as well.. Older Age Favors Polarized Training Models. Most of the runners (Whitlock, Ӧstbye, Keston, and Turnbull) seem to do better with longer consistent runs. I think this makes a lot of sense. As long as the biomechanics are sound (and that’s a huge “if”), consistently doing longer, gentler efforts prepares the body for the demands of distance running. After all, humans evolved to do long slower efforts that could “wear down” injured prey. As Canute noted, however, each of these runners also seasoned their long, slow running with occasional bursts of speed. It doesn’t seem as if these older runners favored intense interval sessions– just an occasional 5-K race or fartlek run was fine. In other words, most of their year-round training involved a polarized training model that combined lots of easier long distance running with a touch of high-end speed work. In the case of Ed Whitlock, he would race more frequently as his key races came closer– similar to my earlier recommendation to use racing as a highly-specific form of training. Injuries and Lifestyle? One big open-question for me is how these runners kept injuries at bay. After all, running two to three hours a day like Ed Whitlock creates a lot of repetitive stress– and unless the biomechanics are perfect, something eventually has to give. Something tells me that a big part of the equation is hidden and outside of the training. And first and foremost on my list is whether these guys had jobs that required a lot of sitting or if they remained standing for most of the day?